The summer season is coming to an end and that means that fall allergies are quickly approaching. In order to better enjoy the fall season it’s important to prepare your home for the seasonal change. Keep in mind that throughout the summer months dust and other inconveniences have a tendency to collect in your home. How do you prepare your home for the change of seasons? Air filters: We always suggest changing out your filters with each changing season, sometimes even more frequently depending on your location and how often you run your system. Duct Cleaning: Throughout each season dust collects in your ductwork causing poor indoor air quality. During the summer months pollen has a tendency to collect in your ducts making your summer allergies continue throughout the fall months as well. It’s important to get your ducts cleaned following the summer in order to improve your homes indoor air quality. Ventilation: The U.S. Environmental Protection Agency (EPA) suggests ventilating your home properly. If the fans used in your kitchen and bathrooms do not vent outside, this move is an excellent place to start. Opening windows when the weather is nice will also allow fresh air in and to help push pollutants out. If you’re in need of any HVAC maintenance in order to get your home ready for the fall and winter seasons, call Poorman’s Heating and Air Conditioning, (260) 422-3534. We take great pride in our services as well as the satisfaction gained from our loyal customers. Many of you may be unaware of the fact that at Poorman’s Heating and Air Conditioning we not only take care of your HVAC systems, but we also take great pride in our plumbing area of experitise as well. We get asked on a daily basis about the differences between a tank and a tankless water heater. Regular water heater tanks are created to keep your water hot for 24 hours a day, seven days a week even if you’re not using the warm water. The more energy efficient approach would be a tankless water heater which only gets your water hot on demand. Believe it or not, your tank style water heater causes you to loose 30% efficiency due to the constant heating and reheating of water all day every day. Your bills can definitely reflect this over time as well. Even though the original cost of the tankless water heater is significantly more than a tank style heater, you end up saving up to 50% on your utility bill! You can even qualify for a Federal Tax Credit through Energy Star. It seems as though tankless water heaters are no longer just a ‘thing of the future.’ They’re here and they seem like the best option for your water heating needs. …Not to mention they’re compact! Who wants a bulky water heater hanging around the house? If you’re interesting in going tankless, call in the professionals at Poorman’s Heating and Air Conditioning (260.422.3534). Poorman’s specializes in heating systems, air conditioning units, plumbing services, geothermal and indoor air quality. You won’t be disappointed with Poorman’s quick response and affordable, outstanding service. Yes, Fort Wayne Fans it’s that time of year again! Help spread the word regarding your great service from Poorman’s by voting for us in the 2014 Fort Wayne Readers’ Choice Best of…contest! 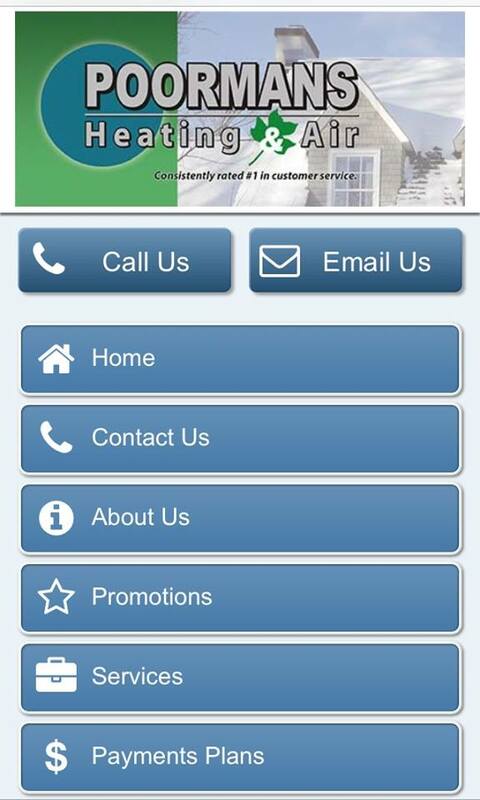 Poorman’s Heating and Air can be found in the ‘Show Services’ category under the Home-Heating and Cooling section! Check out the website here! We greatly appreciate your support and we take great pride in serving the Fort Wayne area! If you’re in the need of some HVAC assistance, call the experts at Poorman’s Heating and Air Conditioning (260.422.3534). Emergency services are available 24/7. You won’t be disappointed with Poorman’s quick response and affordable, outstanding service. Don’t forget to check out Poorman’s Facebook page! “Like” us! Today starts the 41st year of The Fort Wayne Home & Garden Show! We’re excited to be involved in yet another year of this great Fort Wayne expo! Come out and visit us at booth #358 today through Sunday (March 2). We look forward to seeing you there! With over 650 exhibits it is the largest Home and Garden Show in the Tri-State area. It is much more than your average Home Show, we offer fun for the WHOLE Family. For more information, visit the Fort Wayne Home and Garden Show website. If you’re in need of some HVAC or Plumbing assistance, call the experts at Poorman’s Heating and Air Conditioning (260.422.3534). Emergency services are available 24/7. You won’t be disappointed with Poorman’s quick response and affordable, outstanding service. Don’t forget to check out Poorman’s Facebook page! “Like” us! With one of the coldest winters on record, we can almost bet that your energy bills have been quite a bit higher than normal. Granted, we know it’s the winter season…but has your heat ever been cranked up this high? Did you know that www.energystar.gov has a website that helps you to determine your homes energy usage? This website also helps you determine how your home measures up on energy usage compared to the homes in your neighborhood.